Sizes 2 - 5 yr. This nostalgic linen topper transforms a simple dress into a gown befitting a pint-size princess. Padded satin stitched scallops encircle the sweet heart neckline & rounded "V" shaped waistline. 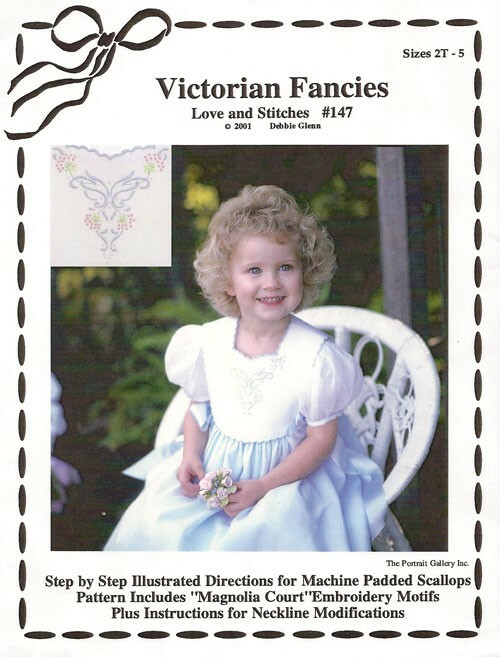 Multi-sized pattern includes sized embroidery motifs, step by step illustrated instructions for replicating variable width high relief padded scallops by machine, plus round neckline modifications.